Senator Rashidi Ladoja, against the review of the 1959 Olubadan Chieftaincy Declaration law. In the suit, Governor Abiola Ajimobi and the Chairman of the Judicial Commission of Enquiry, which reviewed the chieftaincy declaration law, Justice Akintunde Boade, were listed as first and second respondents. The court, presided over by Justice Olajumoke Aiki, adjourned for ruling and judgment after the lead counsel to Ladoja, Mr. Michael Lana; counsel to Ajimobi, Mallam Yusuf Alli (SAN) and counsel to Justice Boade, Mr. Seun Abimbola, who is also the state’s Attorney General and Commissioner for Justice, concluded their submissions on the originating summons. Counsel to the claimants and the defendants had argued on why the court should rule in their favour. 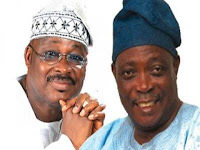 Ladoja, who is a former governor, and Otun Olubadan, Lekan Balogun, had sued the state government for constituting the panel on May 19.